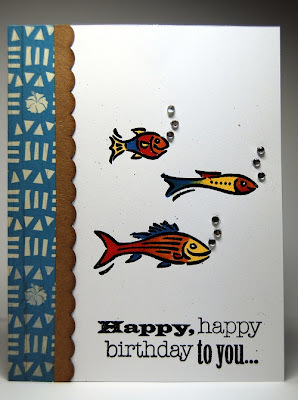 This card was completely inspired by this card by my fellow CTMH consultant, Leisa at Big Red Scraps. When I saw it I knew it would be the perfect card for my son's 13th Birthday. He really wants to visit Hawaii next year so I wanted to give him a tropical fish card and this fit the bill. 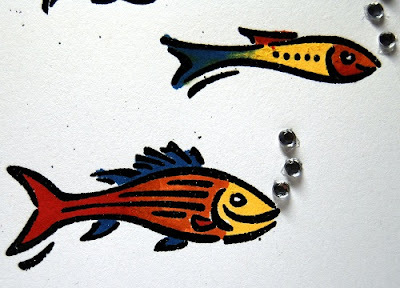 I embossed the sentiment and fish in black embossing powder and used the marker blending technique on the two lower fish. Here is a close up so you can see the blending better. So what exactly is marker blending? Marker blending is when you use dye based markers (CTMH markers are all dye based) and you put one color next to the other and then use the small tip (not the brush end) and basically pick up dots of the darker color to merge with the lighter color. So in the example above, I colored the red in the back and the orange in the front of the fish body. In the center of the fish body, I took the orange marker fine tip and used the dotting technique to blend the two areas together. On the fish with the blue tail and yellow body you can see the green in the center where I've blended the two colors together. I know it seems really simple but I was very surprised at how well it worked! This was one of the techniques taught in the Summer Online Card class I'm taking. Thanks for stopping by! I hope you are in for a fun weekend. My in-laws are coming in on Sunday for a long visit so we're busy getting the house ready for guests. We're really looking forward to spending time with them as its been a couple of years since they've seen the kids. I'm sure we'll have lots of fun and I'll take lots of pictures to fill in some of my summer themed layouts! Awesome card! Perfect use of sparkles!! Have a nice visit with your in-laws!